Celebrating its landmark 25th year, Flickerfest, Australia’s leading Academy® Award accredited and BAFTA-recognised Short Film Festival, and the country’s largest Australian & International short film competition, screening the best of shorts from Australia and around the world for our 2016 Festival. Flickerfest screens for 10 days under the summer stars at Bondi Beach in January 2016, with selected highlights the most entertaining and innovative short films from around the world to tour Australia on a 50+ venue national tour from Jan – May 2016 with Byron shire being the first stop. 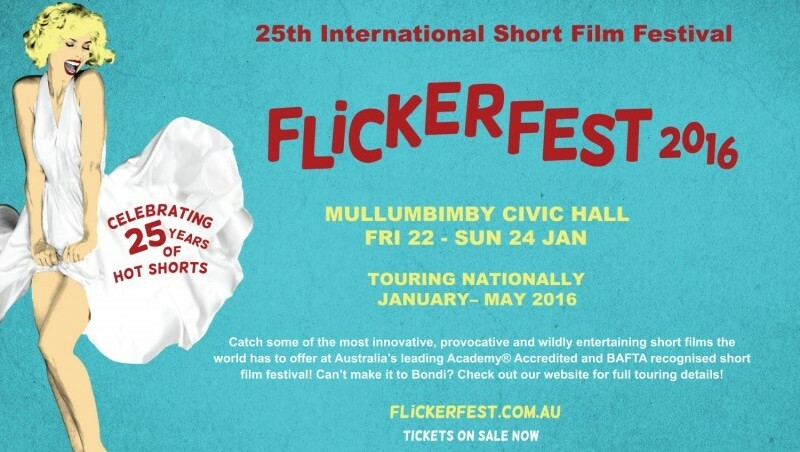 Flickerfest 2016 will be at the new home of Mullum Civic Hall, 22-24 January with the Best Of Australian Shorts, Best Of International Shorts & Short Laughs Comedy programmes. This is one-off chance to see this amazing shorts before they continue their journey around the world; curated from the Flickerfest competition screenings at Bondi; expect to experience the best in short filmmaking Australia & the world has on offer. Flickerfest 2016 Tour Trailer from Flickerfest on Vimeo. And: Final Call 4 Entries – Last Days! iQ Inc is proud to able to provide inspiration & a world calibre benchmark for local filmmakers since 1999, by presenting Flickerfest International Film Festival Tour screenings; & by providing a platform for local filmmakers since 2006. Byron All Shorts celebrates the film-making talent of the Northern Rivers region and encourages audiences to experience the many amazing films & local stories that are produced here each year. Filmmakers form across the region are invited to submit their short films of up to 30min in length, from all genres. Prizes & cash to the value of around $3k will include awards for Best Film, Best Emerging Talent, Audience Choice & more; recognising the incredible talent in our region. If you live in the Northern Rivers, or have produced a film in the Northern Rivers, or have made a film about the Northern Rivers you can enter Byron All Shorts. Byron All Shorts finalists will screen on the 23rd January at the festival’s new venue Mullumbimby Civic Hall; alongside the best in the world at Flickerfest – Australia’s leading Academy® accredited International short film festival.